Though BlackBerry 6 OS isn't a complete overhaul, it adds some much-needed improvements and overall refinement to RIM's mobile operating system. BlackBerry users should be pleased with the updates. But is BlackBerry 6 OS enough to win over new customers and to compete with the ever-growing Android army? Here's a look at what's new, what works--and what doesn't. BlackBerry 6 OS may have a more modern, spruced-up user interface, but BlackBerry owners will feel right at home. The icons and text appear sharper and smoother than they did in previous BlackBerry OS versions, but the overall look is ultimately BlackBerry. 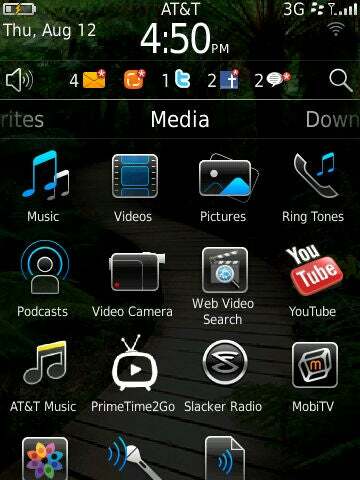 In terms of appearance, the biggest difference between 5 OS and 6 OS is the home screen. In 5 OS, your home screen has icon shortcuts to your frequently used apps (text messages, e-mail, calendar, and so on) running along the bottom of the display, and the time, date, sounds, and e-mail notifications at the top. Pressing the Menu key takes you to a view of all of your applications. In BlackBerry 6 OS, these two screens are combined. 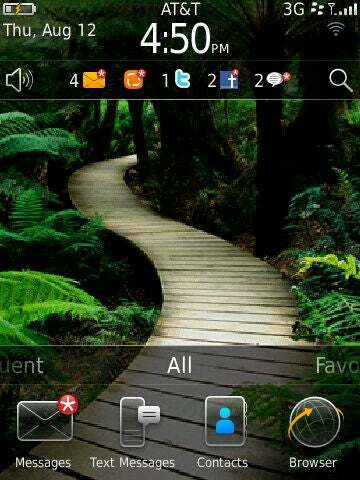 Reminiscent of pre-2.0 Android, BlackBerry 6 OS has a vertically sliding applications drawer. You can slide it all the way up to view all of your apps, or slide it down to view none at all. You can also notch it to view one or two rows of apps at a time. I preferred to keep mine so that one row of apps was showing at all times, so that I could easily access the apps I used the most. You can also slide your apps horizontally and view your apps filtered by categories such as Favorites, Media, Downloads, and Frequent. To add an app to your Favorites, you simply touch and hold the app's icon; a pop-up menu appears with that option and various others like 'hide', 'launch', and 'delete'. These multiple views sound a bit excessive on paper, but I liked having some choice in how I set my home screen.